Producing art for commissions feels like the ultimate compliment for your art business. Someone has liked your work so much they want to buy a piece before it’s even created. Meanwhile, you are enjoying the rare position of producing a piece of art with a guarantee of payment for your efforts. Commissioned art is not without its difficulties. Selling something that doesn’t even exist yet means that you have to build a transparent, trusting agreement between you and your client. Everything needs to be discussed and agreed before you embark on a considerable amount of work translating someone’s ideas into a piece of art. It’s quite a brave undertaking and you need to eliminate all the associated risks. How do you Get Art Commissions? To attract lucrative commissions, your name, work and reputation have to be well and truly ‘out there’ in the market place. The buyer finds you and he likes your portfolio enough to desire something new and unique. The entire process depends on the strength of your market presence. Have a strong online presence within an online gallery or your own website. Make sure you have plenty of publicity material circulating around the art world like flyers and posters. They should refer to your gallery or an internet address. Create a buzz for your work. Word of mouth marketing is an incredibly powerful market force. Make sure you attend as many art, community and local events as possible. Push your name into the public consciousness. 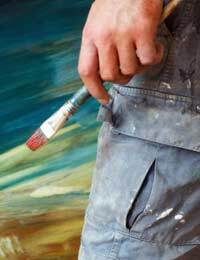 Before you put brush to canvas, make 100% certain you know what the buyer of your art wants out of the piece of art they have commissioned. Who’s is the art for? Don’t assume it’s for them. It could be for a child or a corporate client, both of which will affect the content and style of your work. What do they want from your art? Do they want something that soothes them, inspires them or puzzles and amuses them? Where will the work of art be hung? Images intended for the hallway may be very different from those for the bedroom or study. When do they expect the piece of art to be completed and ready for delivery? Some commissions are time-dependent, for example they may have been chosen specifically for someone’s birthday or wedding. How will it be paid for and how much will it cost? Money can be a sticking-point, make sure it’s discussed and agreed upfront. To address all the questions you need to ask, you should develop a rigid agreement to smooth the way for the commission process. Having asked all the essential questions surrounding the commission, write the responses down! This makes it formal and nobody can claim that there was a misunderstanding. Compile some of the responses into a contract. This feels alien for some artists but remember that commissioned art is also a business agreement. In the contract, make sure you include details about the nature of the art like briefing notes, payment terms and delivery agreements which include details about the timescale. Before you embark on your commission, ask for some financial commitment in the form of an advance. Throughout the commission process, make sure that your client reviews the artwork at regular intervals. This gives you the opportunity to get continued feedback and the chance to tailor and alter your work accordingly. Commissions needn’t be frightening prospects, you must remember they are an immense compliment to your reputation. Build on this reputation by ensuring the entire process is a great success for both parties.